We will be cruising... setting sail... on the briny... soaking sun this spring. 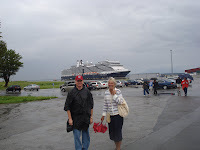 Last July we were on board with siblings, and saw the Baltic. Walked the streets of Russia, shopped our way through Estonia. Drank enough coffee in Sweden to sink a ship. Ate fresh bread in Finland and purchased Christmas decorations in Germany and Denmark. It was wonderful... it was cold. Not so come March. Dale and I are heading south to the Caribbean. So, why wait until March... not us, at least not our minds. We have begun the excursion with Caribbean meals, drinks, and our first ever trips to a tanning booth! This cruise is expensive and we are milking it for everything it can give us - from January until we fly back home. Sigh. It is such fun. I sun burn with a vengeance. I'm allergic to lotions so, the doc agreed, the tanning booth was the way to get started. So, twice a week Dale and I trip into the local tanning salon. It is -13 today, my bathing suit looks horrendous - but soon I will be a tanned goddess. Ha ha ha We have tanned three times... so the lines are beginning to show again. So are white stripes down my sides where my arms lay straight... have to figure that out. Always something to think about! At the home front, we have been cooking Caribbean. I will probably sun burn in St Lucia, but in Michigan I burned my insides out with an extra shake of 'jerk' spice on the chicken. Powerful stuff that island food! For the presentation, I went to the florist and bought bright colored flowers and lilies. Since it is pretty nippy in this neck of the woods, and in the house, these fresh flowers are thriving. I have them in six vases, four of them are very tiny red glass vases. The feeling is fun in the sun everywhere. I hope when you take the time to enjoy the blessings that you have and that you exploit your resources as best you can. Build the excitement and the luxury of a vacation before you get there! By the way... first time laying on the tanning bed, I had no idea the lid came down, or was supposed to come down until I tried to stand up, and it moved. I can only imagine that others have had funny experiences in vacation preparation. Can you relate? Those are 2 good looking people right there. We are already discussing our family-vacation this July to Disney World! It is so much fun to look forward to excitement!